← How Much Evidence Do We Need to Take Action? NASA’s new Orbiting Carbon Observatory shows potential tectonically-induced CO2 input from the ocean? More factors not built into climate models. Ocean warming and CO2 generation. Not that the latter is an issue on its own. 3) the Emperor CO2-hotspot, see Fig. 1. Fig. 1 Portions of the initial published OCO2 data, showing the locations of the three CO2-hotspots discussed herein. 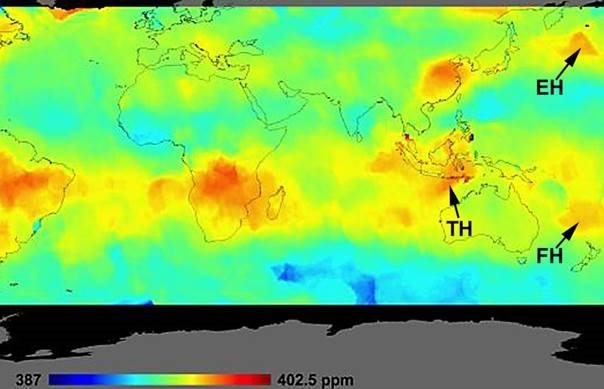 TH=Timor CO2-hotspot; FH=Fiji CO2-hotspot; EH=Emperor CO2-hotspot. They are all apparently associated with tectonically active processes on the underlying seafloor.